Includes: Blue Jay, Butterfly Weed, Cardinal Flower, Downy Woodpecker, Eastern Bluebird, Eastern Fox Squirrel, Inca Dove, Maxmillian Sunflower, Monarch Butterfly, Northern Cardinal, Northern Mockingbird, Painted Bunting, Red-bellied Woodpecker, Red-eared Slider, Ruby-throated Hummingbird, Wood Duck. 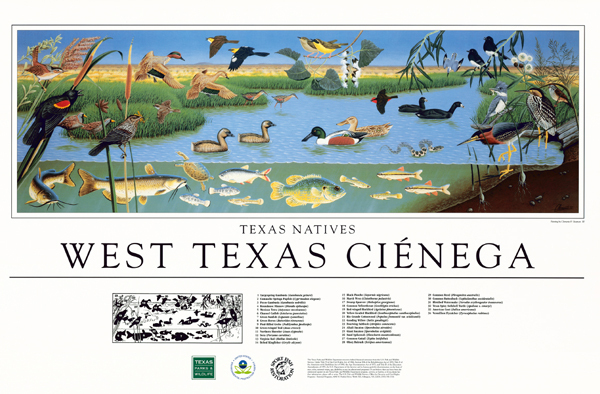 Includes Spotted Gar, Largemouth Bass, Red-shouldered Hawk, Louisiana Milk Snake, Timber Rattlesnake, Yellow-billed Cuckoo, White-tailed Deer, Western Cottonmouth, Southern Leopard Frog, Bald Cypress, Flathead Catfish, Marbled Salamander, Big-eared Bat, Giant Floater, Warmouth, Bronze Frog, Southern Copperhead, Flier, Hellgrammite, Dogwood, Sweetgum, Northern Flicker, Pine Warbler, Redfin Shiner, Green Darner. Includes Reddish Egret, American Oystercatcher, Black-necked Stilt, Long-billed Curlew, Fiddler Crab, Stone Crab, Roseate Spoonbill, Eastern Oyster, Common Blue Crab, Piping Plover, Kemp's Ridley Sea Turtle, Lightning Whelk, Whooping Crane, Common Raccoon, Texas Diamondback Terrapin, Northern Harrier, Atlantic Croaker, Atlantic Bay Scallop, Sheepshead Minnow, Seagrasses, Spotted Seatrout, Red Drum, Pinfish, Gulf Salt Marsh Snake. Find additional wildlife fact sheets on our Wildlife Fact Sheets page.